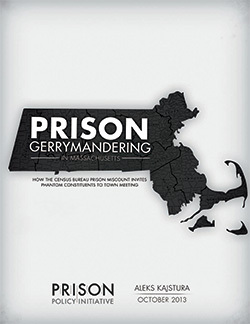 New report reveals prison gerrymandering at town meeting in 7 Massachusetts towns. Easthampton, Mass. – Chances are, if there’s a prison on the other side of town, your voice in town affairs is muffled. Why? Because the Census Bureau counts incarcerated people at prison locations—where they neither vote nor reside— rather than at their home addresses. When governments use this data to draw electoral districts, they grant undue political power to people who live near prisons and dilute the votes cast everywhere else. Although not always intentional, this “prison gerrymandering” often results in significant voting inequality. 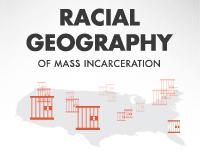 A new report from the Prison Policy Initiative, reveals that the Census Bureau’s counts of incarcerated populations lead 7 Massachusetts towns to dilute the votes of residents who do not live in the precinct that contains a correctional facility. In both Ludlow and Plymouth, for example, 35% of a precinct’s representatives at town meeting are attributed to the jail population. That gives any 65 people who live in those precincts the same voice at town meeting as 100 residents from any other precinct. The towns of Billerica, Dartmouth, Dedham, Framingham, Ludlow, Plymouth, and Walpole each contain a precinct where 17% to 35% of the precinct’s representatives are directly attributable to the Census Bureau’s prison miscount, finds the report. “For most of these Massachusetts towns, the Census Bureau’s prison miscount just wasn’t on the radar,” Kajstura said. “But fortunately, towns can make simple adjustments to keep the Bureau’s prison counts from distorting local democracy.” The report concludes that even though the problem of prison gerrymandering originates from the Census Bureau’s methodology, towns can take action to address prison gerrymandering. Additionally, a resolution calling on the Census Bureau to solve the problem nationwide by agreeing to tabulate incarcerated people as residents of their home addresses in the decennial census is currently pending in the Massachusetts Legislature, and just passed out of Joint Committee on Election Laws. The new Director of the Census Bureau, John Thompson, recently stated that he has not yet decided how prison populations will be counted in the 2020 Census. Bills are filed to keep two towns from having to add expensive precincts due to prison populations being counted in the towns. What if the prisoner is from “no fixed address.” Do you now count them as living where his crime was committed? Does every prison keep detailed prisoner records, and will they all share the information with census counters? It’s a tough decision. Yeah, these prisoners don’t vote or use services in the towns where they are incarcarated, but they don’t vote or use services back in their old home towns either. Prisons do keep extensive address records and in both New York and Maryland the address data was shared with the redistricting authorities so that they could adjust the Census’ data for redistricting purposes. In those states if an incarcerated person has no known address on record, they are not counted in any specific spot (they count toward the state’s total population, but are not counted in any one district). The Census Bureau itself has its own procedures for dealing with missing information, including where to count homeless people for census purposes. And even though incarcerated people often can’t vote, they still remain legal residents of their home address. And they remain constituents of the representatives of their home district.